Ethical writer; lived at Frankfort-on-the-Main at the end of the seventeenth century and the beginning of the eighteenth. Elhanan published in Judæo-German an ethical work, "Simḥat ha-Nefesh" (Frankfort-on-the-Main, 1707). The book enjoyed great popularity and was reprinted many times. The eminent woman preacher Vögele der Maggid frequently referred to the book, and Berthold Auerbach mentions it in his "Dichter und Kaufmann" (ed. 1855, p. 54). 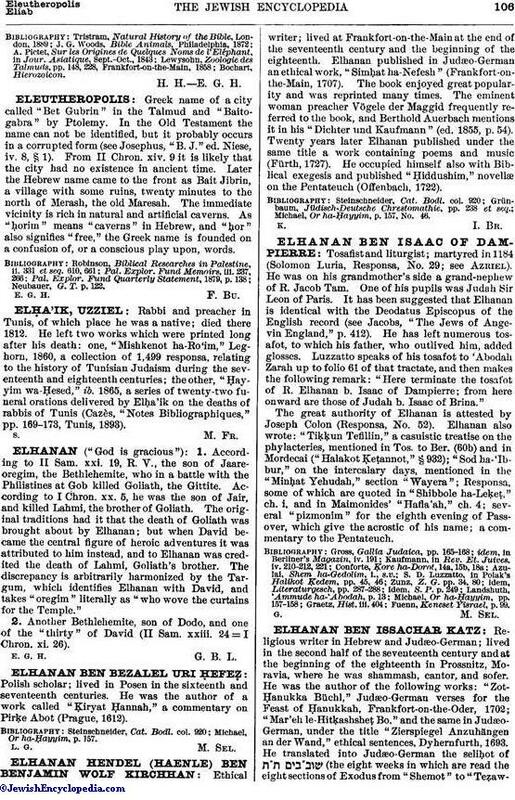 Twenty years later Elhanan published under the same title a work containing poems and music (Fürth, 1727). He occupied himself also with Biblical exegesis and published "Ḥiddushim," novellæ on the Pentateuch (Offenbach, 1722). Michael, Or ha-Ḥayyim, p. 157, No. 46.